2005 Lagoon 440 lying in Sicily, found in great condition and fully specified for World Circumnavigation. This Lagoon 440 Owners version benefits from a wealth of upgrades, including; solar panels, wind generator, water maker, upgraded battery bank, electric winches, full safety equipment, copper coat hull, tender and outboard to name just a few items. Down below the port hull hosts two double gusts cabin, with the master cabin located in the starboard hull. All three double cabins feature ensuites with showers. The current owner purchased this Lagoon 440 in September 2018 and during the winter has prepared the boat for years of travel in the Mediterranean and Caribbean with 2 children, but their family’s plans have changed, so their is a great opportunity here to pick up a fully prepared boat ready for your adventures. A 44 foot owner’s version at a very reasonable cost considering the history, condition and the upgrades. She offers immense space and all you need for comfortable Mediterranean or world cruising. The Lagoon 440 targets two distinct customer bases: ocean cruisers with an emphasis on performance and ultra-comfort. A simple glance at the boat is enough to notice its main distinguishing characteristics: a rigid bimini, with an integral helm station, rigid railing, dingy davits and solar panels. Milos has the helm station at its ideal central location, with an extra- wide bench seat and double lounge cushion where guests can join the helmsman and participate in the joys of sailing. This Lagoon 440 is powered by twin Yanmar 54hp diesel engines with saildrive and 3100 engine hours. She also benefits from a 5kw generator, 200l/h watermaker, air conditioning and heating. This Lagoon 440 features a full battened mainsail, furling genoa, and gennaker/cruising chute. She also has a lazy bag, lazy jacks and electric winches. 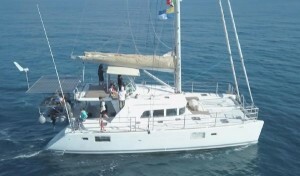 The cockpit of this Lagoon 440 is lined in teak, she has cockpit cushions, cockpit table, two swimming ladders, two cockpit showers and a passerelle to aft. The cockpit is sheltered by a sprayhood and bimini, and has the added benefit of cockpit speakers. This Lagoon 440 also features a Quick 1200w electric windlass. 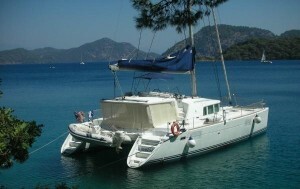 Accommodation for 8 guest + crew is provided on board this Lagoon 440. There are 4 double cabins, each featuring plentiful storage and ensuite bathrooms with heads and showers. There is also a crew quarters with crew heads. A large saloon area provides space for relaxing and dining. The galley is well equipped with a double sink with hot and cold water, sea water pump, oven, microwave, 2x refrigerators and a freezer. This Lagoon 440 is also equipped with a 3.6m tender and 2x dinghy davits. The Lagoon 440 is an ocean cruiser with an emphasis on performance and ultra comfort within a controlled budget. This is the four cabin version with crew cabin and heads. A simple glance at the boat will show you the main distinguishing characteristic, a rigid bimini with an integral helm station with an extra-wide bench seat where guests can join the helmsman and participate in the joys of sailing. The saloon is voluminous, with a ‘U’ shaped seating area for eight around a table. Unlike many other boats this one has seating on both sides doing away for the need to use folding chairs. There is a well equipped galley to starboard facing out towards the cockpit with a sliding window for passing food through. The stainless steel counter top has a double sink and mixer tap plus an integrated draining area for dishes. There is a three burner stove with oven and grill. A 12-volt 150 litre fridge is standard and there is a freezer too. The navigation area is placed opposite the galley, looking forward. There is a sufficient room for electronic navigation equipment and a set of duel engine controls here. In each hull there are two double cabins each with their own ensuite facilities. All berths are two meters long (6’7”) and 1.67 (5’2”) at their widest point. There is ample storage area throughout. There is a single crew cabin forward in the port hulls and the starboard is equipped with a toilet and shower. Outside is a clutter free cockpit with ample seating for eight people around the large composite dining table. This can be hidden away and stored in the bimini roof when not required. There are two stairways up to the flybridge with the portside one providing the easiest access leading straight up from the cockpit. Once up there you can see all parts of the boat at a glance which makes berthing quite simple. The large cushioned bench seat can take four or five people comfortably. There is an additional seating area forward with a relatively deep foot well with substantial drains. A windlass is located in the anchor locker and is fitted with a 33 kg Rocnor anchor with 100 metres of chain. There are also a 25kg Delta anchor with 20 metres of chain and 60 metres rope and a 10kg Danforth anchor with 10 metres of chain and rope. 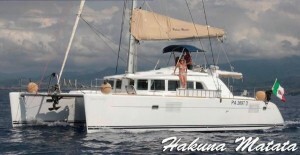 A great opportunity to own a family cruising catamaran with all the bells and whistles…. � Copyright Nicolle Associates 2009-2019- Privacy Statement - Site by Boats Group.